The equipment in the weave department is fantastic, I feel really lucky to have been able to work on a large variety of looms and develop my experience with industrial equipment. 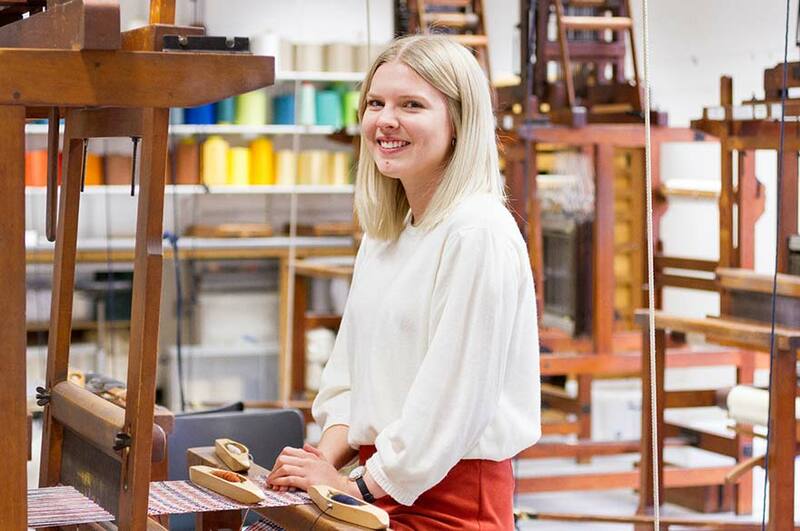 What made you choose to study BA (Hons) Textile Design at NTU? What is the most valuable thing you have learnt from your course so far? Has the course included any speakers / lecturers from industry? “One of my favourite guest speakers was Lisa Salama, who is an embroidery designer that worked for Mary Katrantzou. I love her bold style and I found her work for Mary Katrantzou really inspiring as I also want to work in the high-end fashion market. "The equipment in the weave department is fantastic, I feel really lucky to have been able to work on a large variety of looms and develop my experience with industrial equipment. The Bonington building is also a great place to study, there is always a creative vibe and the art shop has a great selection of materials. As a whole, the NTU City Campus is always busy and full of life, the library has great resources and the staff are helpful. The SU is good fun and right in the middle of campus, so it’s super easy to get to and socialise." Why would you recommend your course and NTU to prospective students?